In early December, Shawn, Taro, and I had the opportunity to visit the site of the future Eco Misool Resort and meet with Andrew Miners. Many of the infrastructural items that will make transport and resort living realistic are not yet in place. Nonetheless it was very important to get a first view of the work being done to put things in place. Our 2 primary goals were to review the land site and the diving. 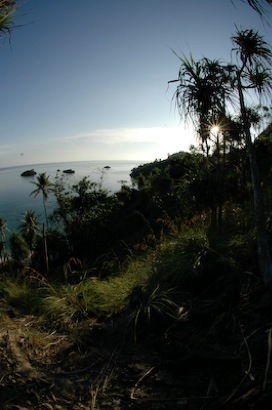 We traveled from Singapore and eventually arrived in Sorong, West Papua. Currently, there is no high speed transport to the island from the “mainland”. Andrew is in the process of reworking a fast rescue boat that may be used for transport, but until that is in place, getting to the island takes around 14 hours or more. In our case we were offered spots on a wooden ship that had been rented by Conservation International (CI). CI has a strong presence in the area and is actively researching environmental programs (marine sanctuaries, etc.). 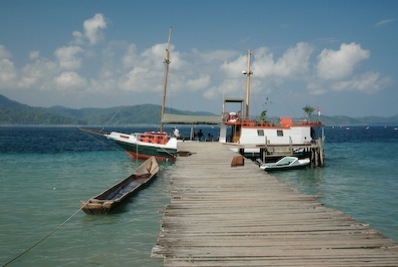 Helen (of CI) had rented this boat to travel around Raja Ampat for a week and meet with villages to discuss future environmental programs. Due to this important work, our journey actually took closer to 24 hours. During this time we had the opportunity to meet with children in the villages and show them underwater videos on a laptop and educate them about the wonders in the ocean all around them. 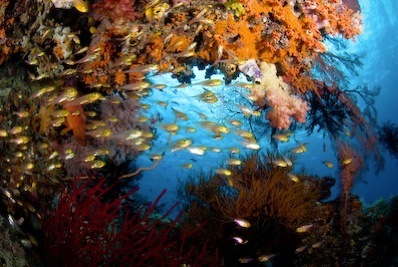 Many Indonesians do not swim and have never seen the beauty of their reefs. If we expect them to protect and steward their seas then they need to become emotionally connected and proud. We received an amazing, excited response from everybody we met. We decided this was something we would like to invest more in, perhaps having a small mobile theater and bringing snorkels and masks to villages to educate the children. Upon arriving at the island, we took a brief tour. Andrew has set up a temporary camp for the 15 local workers and 4 or so foreign workers who are currently building the resort and conservation center. They are currently focused on the construction of the dive center and a beautiful stone path up and over the island. Their goal is 25 year quality construction. 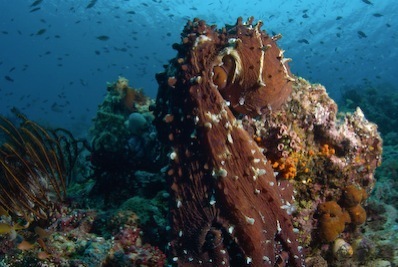 The dive center is a centerpiece of the resort – large natural construction with wide open views of the central bay. The view from the oversized deck is simply stunning. They are designing the building very artistically to merge with the natural rock of the island to form the back wall. I am confident it will be of excellent quality. The central bay is the primary focus of the resort. It contains the dive center, restaurant, and all the rental cottages. The premium investor cottages are located both out on the point of the bay (for better view, breeze, and privacy) as well as on the south beach (take the stone path to hike to the other side of the island). They will be built over the water, right next to the wall of the front house reef. 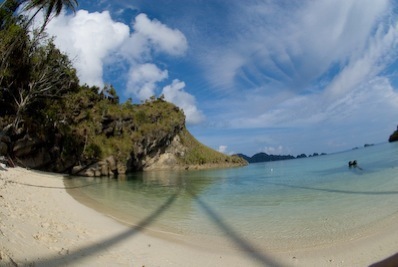 This will give “roll out of bed and fall in” access to fantastic snorkeling and diving. Now, for the diving! 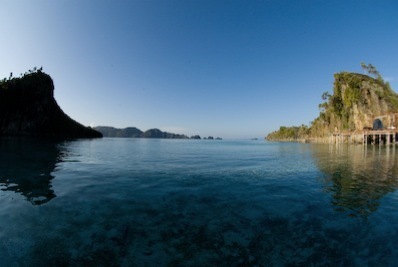 The water in Raja Ampat is very warm and for the most part quite clear and blue. Occasionally (as we experienced for 2 days in the middle of the trip) this rich plankton filled water can grow murky. 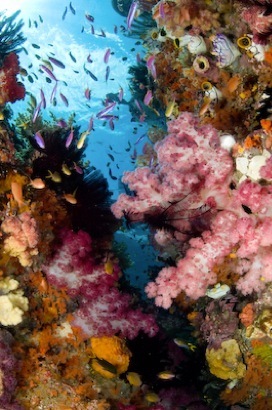 Without a doubt all of us experienced reef structures, color, and density we had only dreamed of. 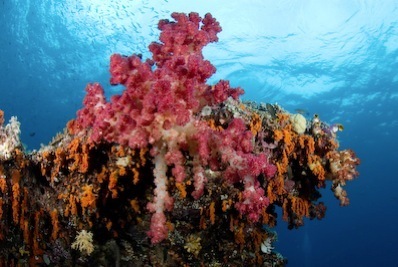 The vibrancy of the coral is difficult to communicate – it’s a bit like a bright carnival of colors. I only hope that the photos with this report can give you a rough idea. Raja Ampat is exploding with soft and hard corals, but additionally we saw some of the largest schools of fish any of us had experienced. Shawn best described the school sizes by comparing it to Galapagos, a world class site with typically low visibility and chillier water. Andrew had just received his compressor and we were some of the first divers from the island. The region is huge and stunningly unexplored. Many of the boat dives we took were in location no-one had ever dived before. We even went in search of (and located) and old WWII Japanese boat based on village rumors Andy had gathered over the years. Unfortunately, although we found it, it had mostly been eaten by the sea. As we all know, a major component of Eco Misool is centered on conservation. In addition to the diving we had the opportunity to visit some turtle nesting beaches around Batbitim. These nests have been under stress in the past as turtle eggs have been taken and sold on the market. Now, with help from Andrew and Eco Misool these areas are being patrolled and protected. In fact, Andrew has leased a turtle nesting island as a special turtle conservation area. When we were diving we saw quite a few beautiful turtles underwater. Hopefully with proper protection this number will grow dramatically. The villagers say that a long time ago this region had so many turtles that you could walk on the backs of them across the ocean. That would be a wonderful goal to restore. Based on the diving we did, I am most excited by the miles and miles of untouched, unexplored islands and reef all around the resort. Almost all of it is more impressive than anything I have seen to date. The seas were almost perfectly calm. Dolphins swim past every day. There are schools of Tuna almost continuously feeding on the surface of the water. What a paradise!